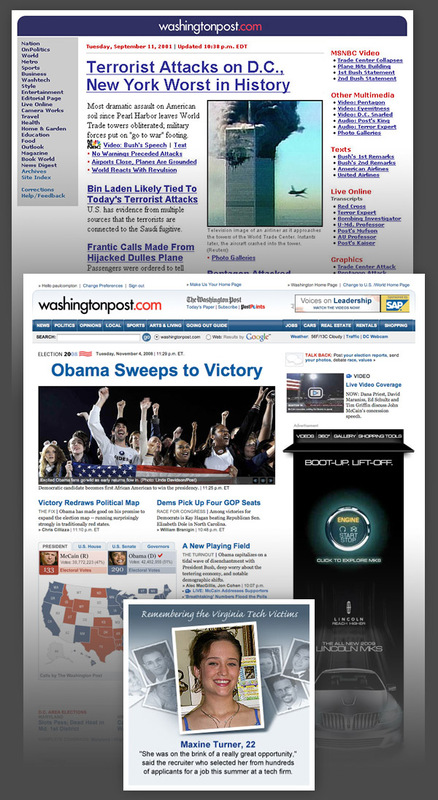 In the summer of 1996, the Washington Post launched its first web site — washingtonpost.com — after producing Digital Ink for a year on a proprietary dial-up platform called Interchange. I joined The Post in February of that year to help design that first site. If you think these pages look primitive, that’s understandable because they were. We could conceive a better presentation, but were hamstrung by technology of that time. Many bright people put their heads together to pioneer this untapped medium. Mistakes were made, things were messy, and feasible options for presenting the news were severely limited. Dial-up modems were so painfully slow that every morsel of a download was thoughtfully considered for value. Organizationally, think of a large ship lowering a small boat off its side into very choppy waters. The web site staff of a few dozen employees coordinated closely with the mother ship. Those choppy waters were maddening to navigate. We often laughed to keep from crying. Unfortunately, there was no manual on how to present news online. It was comforting to know that other media companies were also winging it. So, we rolled up our sleeves and got busy. During my time at The Post, the news kept happening. From presidential elections, natural disasters, 9/11, local tragedies, sports triumphs and defeats, wars, and all the milestone events of a decade and a half, we plotted along in a constant state of reinventing ourselves and our product. While all of this was occurring, we were designing and building the online classified products (Jobs, Cars, Real Estate) as well as doing our best to monetize advertising. There was always a combination of planned projects and newly erupting events that could change your day, week or month in an instant. I worked hard to put the best design team together, give them full support, and provide a healthy environment for learning and sharing. From the mid-2000s on, I spent more of my time leading, managing and mentoring than I did designing. While I was honored to serve in those ways, the lack of hands-on designing weighed on me. I am forever grateful for my experience at The Post. It connected me to many brilliant people, taught and helped me develop skills and attributes that have served me since. Working in a deadline-oriented work environment, in tandem with larger planned projects, have been valuable as a small businessman—and designer. I learned about discipline, flexibility, and what it takes to be trustworthy. Working closely with people at all levels of an organization, across a wide array of disciplines, gave me an appreciation and much greater understanding of how the pieces fit together. My Post experience, in working closely with others, has propelled my business success.